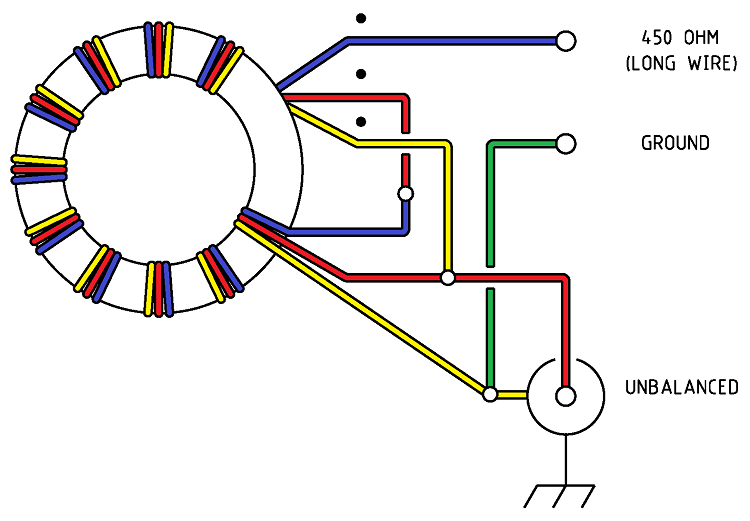 Requiring a unun to feed a long wire antenna ideally without a tuner a 9:1 voltage unun design using a T200-2 Toroid core was selected. PVC covered 1mm diameter copper wire was used with the view that the thicker insulation may reduce the possibility of insulation puncture due to the higher nominal impedance. The triple bifilar winding of 10 turns are wound evenly spaced around the T-200-2 powdered iron toroid core with the three individual windings wound close together. A Green binding posts was selected to clearly identify the common earth connection. The length of enamelled copper wire per winding for the T-200-2 powdered iron toroid core is determined by length per winding = 50mm per turn plus 250mm tails. Table 1 Toroid core with winding suggestions. About 750mm of 1.0mm Covered copper wire per winding. Photo 1 9:1 voltage unun assembled. 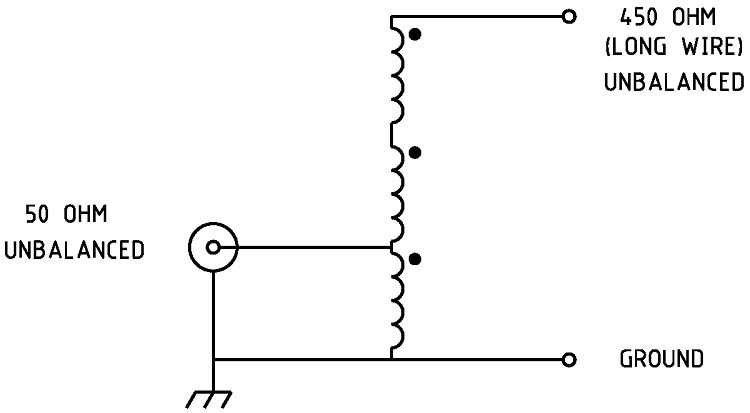 Reactive component of the total impedance also indicating the +/-sign of the value. Inductive being a positive value and capacitive being a negative number. An additional evaluation of the efficiency of the unun was preformed by simply measuring the RF power at selected frequencies fed into the balun and measuring the out put power from the balun using the set up shown in Figure 8. In this set up it was necessary to have two identical 9:1 ununs, the second to step the impedance back down to the 50 ohms for measuring. It is critically important that the two ununs be made in a identical fashion as the results need to assume that half the losses are as a result of each of the ununs as that the below formula simply halves the resultant overall loss. For example, RF was applied to the input of the unun at a frequency of 1.8 MHz at a power of 5 Watts with 0.45 Watts being measured at the output meter. The below formula was applied revealing a Balun loss of 5.2dB at this frequency per unun. 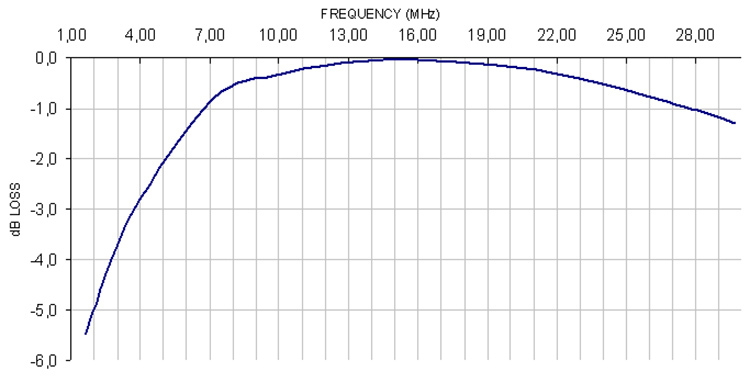 Figure 6 shows the results of measurements taken at various frequencies including the calculated loss. Figure 7 shows the graphed results of the losses verses frequency. Concussion of this evaluation is that the efficiency between 8.0 MHz to 25 MHz is very low as to be unnoticeable and that even at 25 to 30 Mhz the loss would be almost unnoticeable however the losses are high at 3.5 MHz representing a full 'S' point drop or half the power being lost in the unun. At 1.8 MHz the losses are very high at -5.2 dB, almost 2 'S' points. 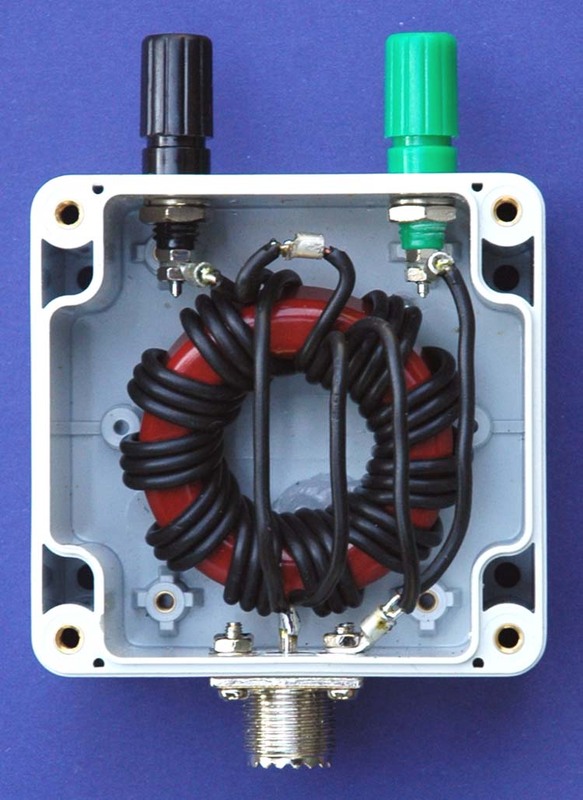 This unun should be useful from 7.0 MHz to 30 MHz and at push on 3.5MHz if nothing better was avaliable. The limitation of this evaluation is that it is under an ideal situation of 50 ohms and that more extreme loads will likely show greater losses. Figure 6 Table of test results. Figure 7 Plot of Balun losses verses frequency. Figure 8 Efficiency evaluation set up.